Have you ever been stuck where you are because you actually become comfortable in the pain? Maybe it’s not so much “comfortable” or necessarily “pain”, but it’s something you know and understand well. You know how to be sad. You know how to eat a lot. You know how to be miserable. You know how to be alone. You know the feeling of pain. It’s comfortable. 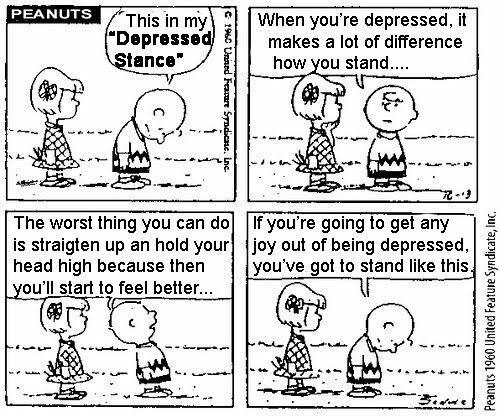 As Charlie Brown says, you’ve got to stand “like this”. See the difference good old Charlie makes in the below cartoon: head down, shoulders slacking and face drooped? If you want to stay where you are, you can. It’s your choice. I was recently at home for six weeks recovering from a surgery. In that time, I didn’t really see many people, I obviously didn’t go to work, didn’t exercise, and did little house work. You get the picture. The closer I got to going back to work, the more anxious I became about returning. That was natural, of course. Part of my reluctance was jumping back into a leadership role, making decisions and being totally immersed in the ministry again. The part that many people don’t talk about was the longer I was at home, the more I didn’t want to go out, the more I wanted to eat unhealthy comfort foods and the more I really didn’t want to see people. I sometimes have to fight myself to make that choice, but I continue to work on that. Don’t get me wrong. There is a time and place where you need to take a step back and allow yourself to heal, recover and “be” in the pain. But when you’re getting to the point that you’re comfortable in it and want to stay there, that’s when you need to move forward. You need to push past that feeling, and start living once again. Have you ever sat in your misery because it seemed comfortable? How did you push yourself out of it and move forward? I just started working with a life coach and he said the same thing. Maybe I’m comfortable in my misery. Maybe I need to be a martyr. I need to ‘suffer’ in order to give myself meaning and worth. Ya, we can sometimes have that mentality that we need to suffer in order to have purpose. Yet, we’re not really made like that, are we? I’d love to hear what your life coach said about moving past that. How did he say to find meaning and worth without the need to ‘suffer’? We haven’t got there yet. Had my first call (introduction) with him yesterday. Week 1 is on vision for your life.